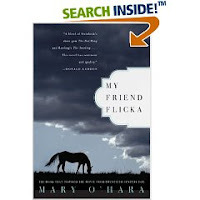 I read My Friend Flicka because my friend Sky highly recommended it. (She's very fond of horses. To put it mildly.) Being the loyal friend that I am, I, not liking horses quite so much, heartily agreed to read it. Then I promised again. Then I made assurances that I actually WOULD read it. And finally I have. My thoughts while reading it, and upon completion of it, was that I didn't really care for it. The book made me feel tense. Ken's relationship with his father, Rob, seemed hopeless at times. Rob didn't mean to be so oblivious to his son's feelings, but he really was! That bothered me a lot throughout the book. The fact that Nell was more attentive to Ken than to her other son, Howard, made me feel like Ken was more of a Mamma's Boy in the most unpleasant of ways. Ken knew his mom would listen when his dad would not. I'm grateful he had one parent's attention but it was still irksome all the same. Flicka's own health, fragile as it was, also kept me on edge. Would she live? Would she die? It flip flopped so much that I didn't have any certainty as to the ending of the book being a good one. The other aspect of the book that made it somewhat difficult for me was all the horse lingo. O'Hara obviously knew about horses. I obviously do not. I read this on the heels of reading Treasure Island and was "kept out" of the book by all the pirate lingo only to find myself again kept out of a story for not understanding the lingo. (Perhaps I should have spaced the two books more, eh?) At any rate, I suppose a did learn a thing or two about horses. Some of which I still wish I didn't know. Having put a few days between myself and the story, I find that I like it much more. It's a story of loyalty which is a character trait I rather admire between friends. Ken's love for Flicka was unquestionable. That is good to see. O'Hara also did a fine job of drawing a person into her story. Not many authors have the ability to keep you on the edge of your seat not knowing whether you can relax or just cry. She is a very good artist. I applaud that and it makes me feel like I have enjoyed the book, in retrospect. Because I like Sky and sorta have to admit that I like this book (to a degree only) I would be willing to read more books about horses. I can't say I'll ever get that into them but it makes for an interesting adventure now and again. Thanks for reading it! The first time I read it I hated it. But as I grew and understood more I Loved it more. Being a lover of horses is much like the book describes, so often it's full of heartache and death but if you are filled with the driving urge to be a horseperson then you will triumph and happiness too. I felt the same way you did about Ken and his mother, then this last time I read it I understood a little more why she was on his side so much; she knew Howard, like his dad, was not romantic or given to daydream, he was grounded, he was ok, he would set his mind and accomplish what needed to be done. Ken on the other hand just couldn't keep his head in this world! He was sensitive and dreamy. She knew that he needed something to get his feet back on the earth, something to succeed at, until then she listened and supported. My favorite scene (other then the happy ending FINALLY) is when Rob sits out in the rain with the horse that caused so many problems to keep her safe from the lion. The stag scene at the end is so beautiful, it's a very artistic way of ending the story. After reading this story could you imagine som idiotic producer replacing little Ken McLaughlin with a *GIRL*????? Stupid people. The next two books are even better.... but I won't pressure you. You can take a break from my horsey books until I have written my own. Which should give a couple of horse literature free decades! I loved the book! It was very touching and like Sky, I am a hores lover myself. The really sad part was the part were Ken was imagining that Flicka's body falling down the cavern instead of Rocket's.